For many brands in the digital age, the internet has become an incredibly important interface for customer marketing. However, the internet also allows access to all your rivals’ brands, so the key challenge is to ensure that customers seek out your brand specifically, and not just your generic sector. In this context, marketers are turning increasingly to offline media to direct consumers to their brands online, but measuring the direct effect of individual media in this respect is a major challenge. Radio: The Online Multiplier is a unique new single-source study that was set up to quantify how exposure to radio advertising influences brand browsing behaviour online. This insight was gained by analysing the detailed internet browsing patterns of people who were exposed to a random sample of 23 ‘live’ radio campaigns, and comparing them to a sample of people who were not exposed. The campaigns measured in the study represent five different product categories: Travel; Telecomms; Motors; Insurance; High Street Retail. Whilst some data is detailed at a category level in this report, results for individual brands have been kept confidential. The study was conducted by research companies Dollywagon Media Science (working with scientists and academics to exploit recent advances in mathematics and computer science) and Other Lines of Enquiry. The study reveals that when they are exposed to radio advertising for a brand, listeners are 52% more likely to include that brand-name in their internet browsing. The 29 brands in the study collectively assigned only 10% of their media budget to radio meaning that, in relation to all of the other media used across these campaigns, radio is four times more cost-effective at driving brand browsing online. 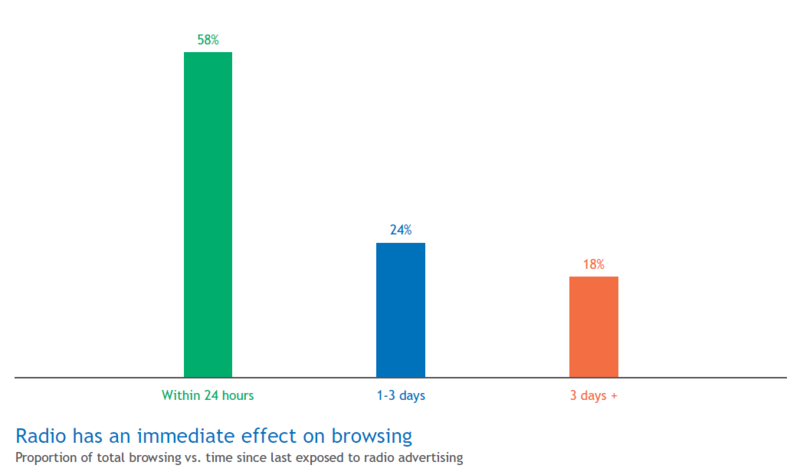 Radio has an immediate effect on browsing – the research highlights that 58% of all browsing that we identified as having been stimulated by radio takes place within 24 hours of exposure to advertising. Radio creative work is crucial in optimising Radio’s Online Multiplier Effect: the radio campaigns which delivered the highest effect on browsing clearly communicated a simple proposition and used strong brand linkage, especially if integrated with advertising in other media. In addition, the best performing ads clearly directed listeners to go online to a straightforward and self-evident brand web address, avoiding ‘forward-slashes’ or one-off message-related URLs. These results highlight the cost-effectiveness of radio for advertisers seeking to drive consumers to interact with their brands online, and the creative diagnostic findings can be utilised to help optimise campaign effectiveness. If you’re planning to use radio to drive people online and would like to test Radio’s Online Multiplier effect for yourself, please contact the RAB to discuss how this methodology could help to measure the effects of your own campaign. The Online Multiplier is the latest in a series of studies into the effectiveness of radio advertising, which have all been developed in response to wider media industry debate. To address this, the RAB commissioned the Awareness Multiplier Study, conducted by Millward Brown International, which demonstrated how reallocating 10% of a TV budget into radio could boost overall advertising awareness by 15%. In 2003, the question had changed to “How do individual media drive sales?” This led the RAB to work with dunnhumby to conduct the Sales Multiplier Study, which used Tesco Clubcard data to reveal how radio drives sales of fmcg brands by an average of 9%. However, in the digital age, the internet has become the pre-eminent customer access point for a huge number of brands. It is the critical interface where, from the comfort of home, new customers can find out about your brand and existing customers can access your product or service. In an increasing number of sectors, like insurance, it can also be the primary point of sale. At the same time the big challenge of the internet for marketers is that it offers free access to the whole market you operate in. For example, if someone searches “car insurance UK” on Google in 2009 they are likely to get over 40 million results: even the highly prized first page of results features over 21 different brands. One established way to resolve this overcrowding is to prime consumers in advance so they will search for your brand rather than your sector – display advertising in the traditional media is widely recognised as an effective way to achieve this. However, to date, marketers have struggled to quantify precisely how individual offline media influence consumers’ online behaviour. Whilst previous studies highlight radio’s complementary characteristics with the internet, there was a clear need to develop new learning about the extent to which radio advertising drives online success for brands. 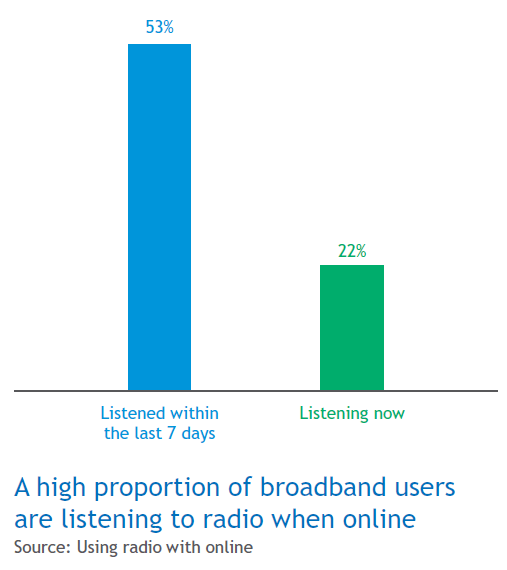 In the joint IAB/RAB study ‘Using radio with online’ from 2005, radio and the internet were identified as having very strongly complementary features. The study revealed that many people use the internet and radio at the same time – almost half had listened to radio while surfing in the past seven days, and one in five (20%) were listening to radio when they were asked to complete the internet-based survey. The 2005 report concluded that radio campaigns excel at reaching out and spreading awareness of messages amongst all listeners regardless of their existing level of interest in a brand, and the internet is highly effective in allowing consumers to pursue their interest in a product or service, up to and including the point of purchase. The 2008 study, Word of Mouse, explored how this dynamic relationship between the two media could be harnessed to enhance a brand’s online effectiveness. A controlled lab test demonstrated how exposure to radio advertising during the search process can have an immediate and significant effect on people’s brand search patterns. Whilst this was a valuable development in radio and online learning, it did not necessarily reflect the broader influence of radio in affecting people’s online brand interaction in the real world. To what extent does radio advertising in the real world exercise a measurable effect on the way listeners browse brands online? What types of radio campaigns are most effective in this respect? How can brands optimise their campaign effectiveness in driving people online? There have been several case histories in the past which have highlighted the way radio affects internet results for individual brands, and also “lab test” projects where a link was established between advertising exposure and online behaviour (see rab.co.uk for more details). What has been needed is a broad-ranging real-world test – where the effect of current radio ad campaigns on detailed browsing patterns could be measured across a number of brands in a variety of markets. The solution required a ground-breaking research approach, jointly proposed by research companies Dollywagon Media Science (working with scientists and academics to exploit recent advances on mathematics and computer science) and Other Lines of Enquiry. The idea was to create single-source data linking exposure to radio advertising to actual web browsing behaviour – the first study of its type. We isolated the radio effect by comparing browsing behaviour amongst people actually exposed to the radio advertising (identified amongst a wider sample of 1,200 Commercial Radio listeners), and compared this to a matched sample of 600 people who were not exposed to the radio advertising campaigns. Therefore, any differences in brand browsing behaviour could be attributed to radio, as all other characteristics were the same. All respondents were active web users who had browsed for, or bought, certain categories of products in the last four weeks. The first key element in discovering the links between advertising exposure and browsing behaviour is the individual’s browsing history. This is a data file inside the computer which is added to every time the user visits a site on the web. Respondents were asked to download a specially developed piece of software which recorded this file. The 1,800 people who agreed to take part in the survey were asked to make their last four weeks’ browsing history available to the researchers, and this was analysed in detail for brand-name mentions (respondents were allowed to delete any sensitive items in the record, e.g. online banking details, before sending the data through). The link between ad exposure and browsing patterns was established using two further stages of capture and analysis. Listening data was captured using a self-completion diary-style questionnaire (the same method as in the RadioGauge series of effectiveness studies – more details available at www.rab.co.uk). The questionnaire focused on the main stations listened to by respondents and daily data for seven days was projected back to replicate four weeks’ worth of data (reflecting the typically habitual nature of radio listening). The final piece of the jigsaw was to identify which advertising campaigns the listeners were likely to have been exposed to. This was made possible using J-ET, the unique industry-wide automated trading system used to buy and sell most major radio campaigns in the UK. J-ET spot transmission data was able to disclose precisely which campaigns were running on which stations, and when, during the research period. In summary, this meant that we were able to construct detailed personal radio advertising exposure schedules at an individual brand level for each respondent in the survey, which we were then able to relate back to their online brand browsing history. Initially a total of 45 campaigns were investigated for the study, but of these only 23 were included in the final analysis. To ensure a robust result, campaigns were only included if a minimum of 50 Commercial Radio listeners had been exposed to the radio advertising. Campaigns were filtered further if they did not actively direct listeners to go online, or only did so for legal or administrative reasons (e.g. “For terms and conditions see www.ourcompany.co.uk”). All of these campaigns featured at least three other media, including internet advertising. On average, they spent 10% of their total media budget on radio. Combined analysis reveals to what extent brand browsing behaviour of the Advertising-Exposed respondents is different from the Non-Exposed. Importantly, the respondents in the study were passively measured: they disclosed their radio listening patterns and they sent through their browsing history, but this was all retrospective, thus avoiding any possibility that the research method might influence their behaviour. It should be noted that this was a test to isolate radio’s effect within the overall media mix. It would be possible to track the effects of some other media using a similar methodology, but this would require a separate project with specific samples to isolate the effect of each individual medium. Based on the average across the 23 brands involved in the study, the headline conclusion is that when they have been exposed to radio advertising for a brand, listeners are 52% more likely to include that brand name in their internet browsing. This is very significant for brands in markets where the internet provides the crucial final stage of customer acquisition or the purchase funnel: radio advertising offers these brands the chance to “turbo charge” this part of the marketing process. 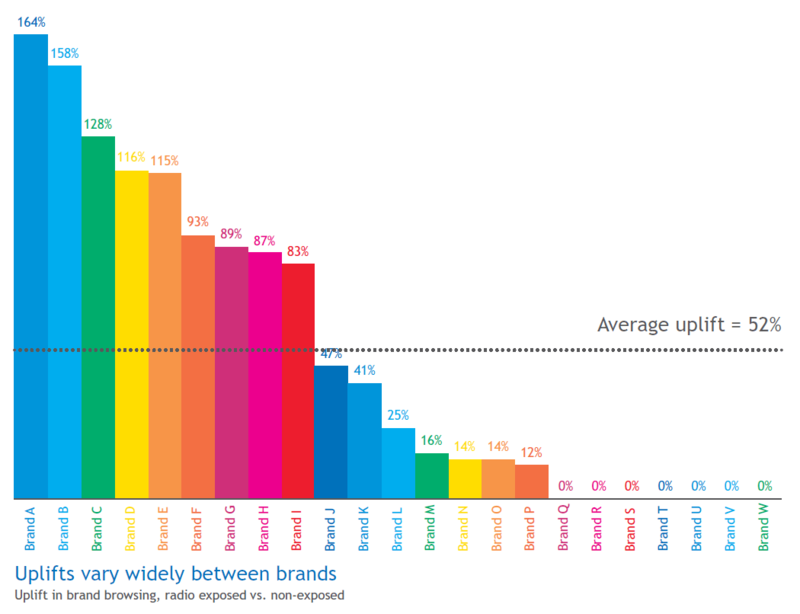 Amongst the sample exposed to radio advertising, on average radio was discerned to have driven just over a third (34%) of the total brand browsing effect, despite the fact that the 23 test brands assigned, on average, only 10% of their media budget to radio. These figures allow us to calculate a Cost-Effectiveness Index for radio (i.e. the % of effect delivered for every % of the budget) by dividing radio’s share of effect by radio’s share of budget = 340 (34% divided by 10%). 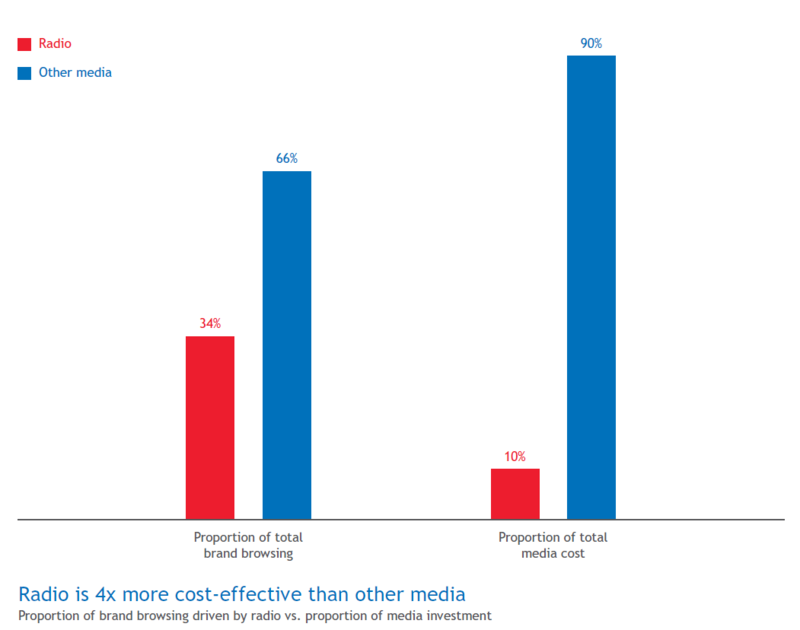 In comparison, other media combined offered 66% of the total effect for 90% of the cost, a Cost-Effectiveness Index of 73. All other things being equal this means that, when added to the mix, radio advertising is over four times more cost-effective than other media (i.e. 340 divided by 73) at stimulating brand browsing online. However, it should be noted that this equation is based purely on averages. 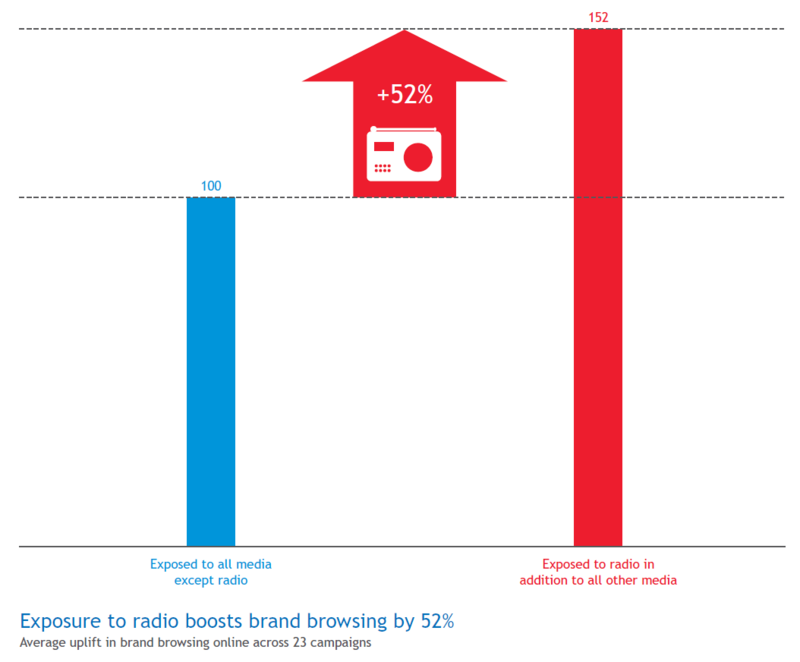 As can be seen in the next set of results, some radio campaigns perform much better than the average, some much lower. So it would be fair to draw the conclusion that, while radio is likely to be significantly more cost-effective than other media, the multiple of difference will vary widely from campaign to campaign. As with all advertising effects, especially amongst randomly selected ‘live ‘ campaigns, there was a very wide variation in results across the 23 brands as Chart 2 demonstrates. While the average uplift was 52%, the lowest performing campaigns saw no uplift at all. However, the highest scoring brand saw a 163% uplift in brand browsing – achieving radio cost-effectiveness 12x that of other media. 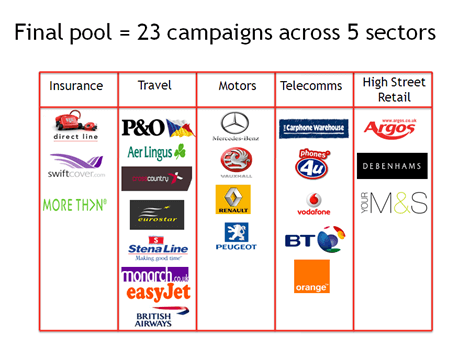 There were significant differences in effect between advertising sectors, as the chart reveals. An overall conclusion is suggested by the pattern of responses by sector. The better performing sectors, like insurance, have simply become more “web-centric” than others, and when consumers want to explore them or take action, the internet is the first place – and the main place – for them to go. However, in four out of the five categories researched, at least one brand outperforms the overall average 52% increase in browsing. This suggests that whilst product category is a significant variable in discerning likely effectiveness of a radio campaign in driving brand browsing, it is not dominant. Looking at the individual sectors in more detail reveals some ideas to explain these headline patterns in response. Insurance is the best performing sector with 70% uplift on average. This is an annualised market, with car and home insurance routinely needing renewal every twelve months, so there is a constant flow of renewals business during the year. Insurance is a mature web category with many purchases now made online, and the sector is becoming even more competitive with the continuing expansion of insurance aggregator websites. The Travel sector demonstrates the second highest average uplift, with listeners who had been exposed to the radio campaigns 59% more likely to feature the advertised brand names in their browsing. Again, Travel is a very mature web category, with a high proportion of research and sales conducted online. 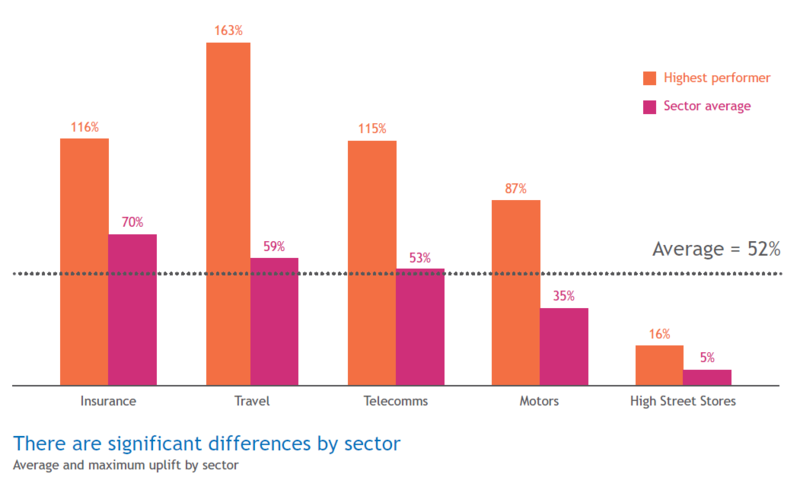 The sector which exhibits the third-strongest average uplift (53%) is Telecoms, and is again a very mature online category for research and purchase. Telecoms advertisers have been heavy users of radio advertising for many years, and tend to use radio to flesh out the detail of short-term offers, providing listeners with a specific reason to respond in the short-term. Also, as today’s telephony market is very cyclical – most people are signed up to contracts which are renewable every year or 18 months – there is a natural flow of renewal traffic in the market. Motors is fourth with a 35% average uplift. This category is slightly more complex, because even though people regularly use the web to research cars, purchase cycles are longer and people rarely buy online. This lower than average category performance for motors may have been exacerbated by the fact that during the research period car sales were still suffering from the negative effects of the economic downturn. Finally, High Street Retail advertisers achieved an average uplift of 5%. However, as the category name suggests, purchasing in this category is still dominated by the high street. As a result, advertisers in this category are generally aiming to drive footfall and store visits rather than web traffic, and this is likely to underlie the lower then average uplift seen across this sector. An additional benefit of using single-source data to link exposure to radio advertising through to browsing occasions for the same brand is that we are able to explore the immediacy of response to radio advertising by analysing the time lag between exposure and the initial brand browsing occasion. The results across the 23 campaigns monitored suggest that radio has an immediate impact on driving people online to browse for brands. The data highlights that over half of the browsing stimulated by radio takes place within 24 hours of exposure to advertising. This is a particularly significant finding for brands seeking to drive short-term response to offers – radio is proven to deliver. This project was not designed as a study into creativity, but it has been possible to review some of the high performing ads, leading to some clear conclusions about how creative can be developed to enhance campaign effectiveness. It seems obvious, but a basic finding is that if you want people to go online to interact with your brand, you need to express this clearly in your advertising. In this context, special web offers can act as an additional incentive to go online. The other critical factor in creative work is brand linkage – i.e. how effectively the advertising is linked to the identity of the brand. Campaigns which featured some form of brand mnemonic did best of all (this included signature tunes, slogans, jingles and other sonic branding devices). This effect was even more emphatic when the branding devices were used across other media like TV and online. This is not surprising given the nature of the test here: the brands which did best were the ones which managed to create a strongly branded space for themselves in the minds of people using the internet, so that browsing behaviour would be steered towards them rather than their rivals. This is an important context point – radio ads are often weighed down with detailed offers or terms and conditions. However, radio ads which drive people to the internet don’t have to “do all the work themselves” – the interaction with the customer will be taken further at the website. This means that the radio ads don’t have to get bogged down in the minutiae of tactical promotions, and can focus on simple benefits and call to action. In summary, if your objective is to get more people to interact with your brand online, then this study suggests that radio is a highly impactful and efficient means to delivering this. If you would like find out more about testing Radio’s Online Multiplier Effect for your own campaigns, please give us a call at the RAB.